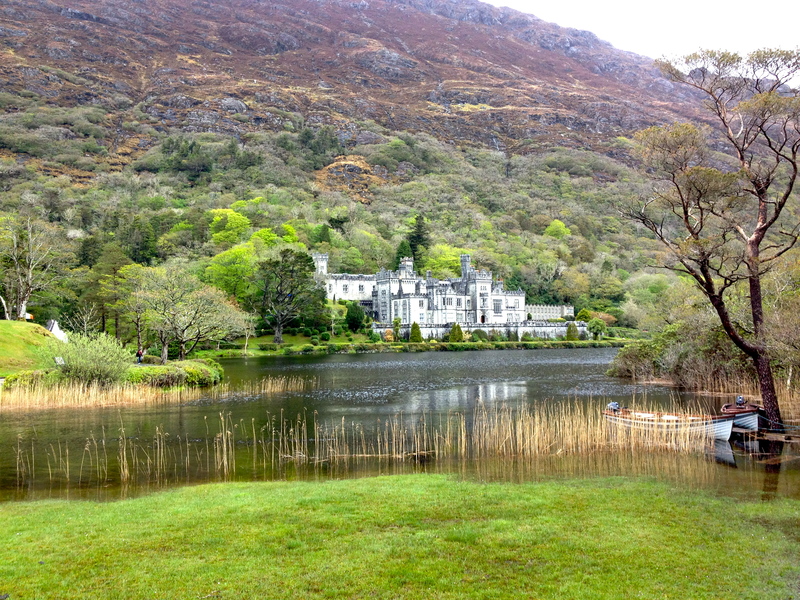 Kylemore Abbey and the Croagh Patrick Adventure: Ireland Days 3, 4, 5, and 6 – Protagonized. Ireland is an interesting place and you can really tell that it’s an island nation. It’s like one big fishing village, except it’s not, because it has big cities. It’s hard to explain. It’s weird to me because America’s average Joe (according to the media) seems to be around 28-years-old. But it’s kind of cool. 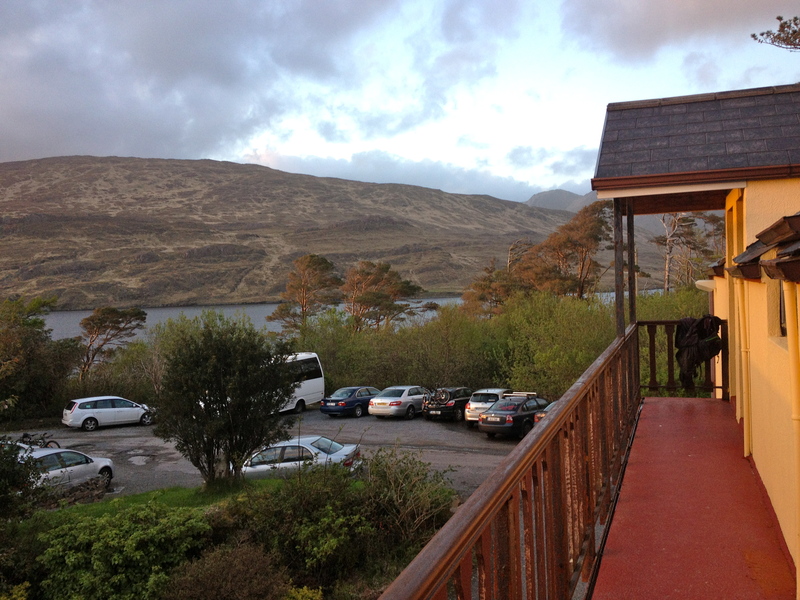 In Ireland, there’s more of a sense that what comes after your 20s is the more meaningful part of your life. People here grow stronger with age. Maybe it’s because Ireland is so old and is seasoned to that, whereas America is young and hasn’t learned to respect age yet. A note about roads and busses: there is no way two busses can pass each other on these roads, but they do. Further proof that busses are magical and are able to do what other cars can’t. I’m starting to not even be worried when we approach another bus because we never hit or even scratch. 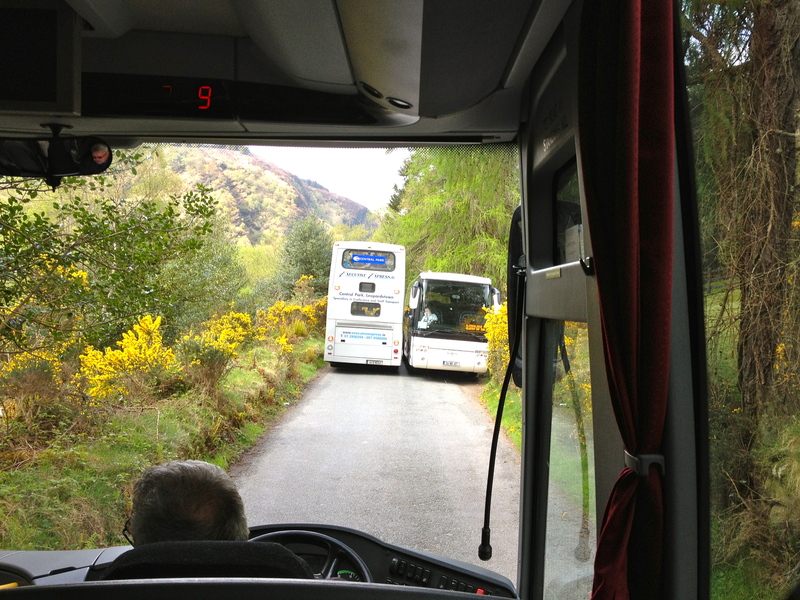 Two giant busses passing each other on a very narrow, one-lane road. 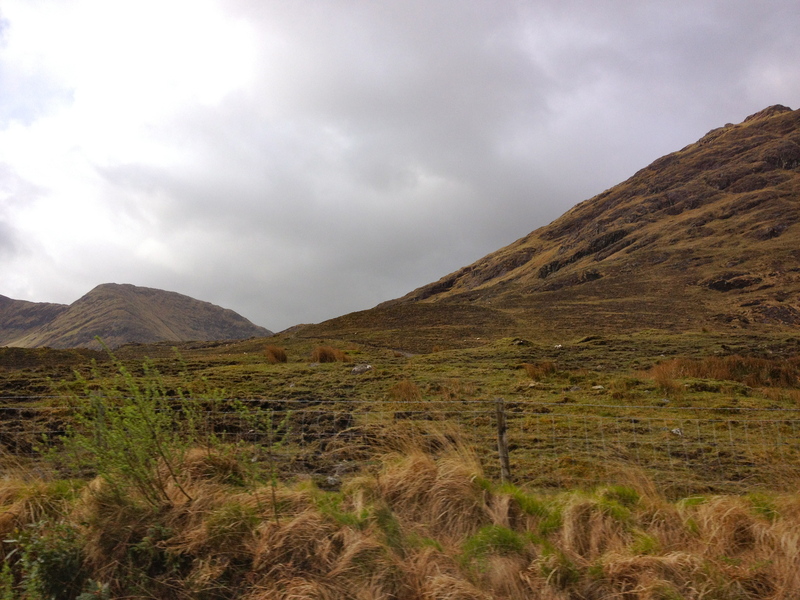 We’re on our way to Kylemore Abbey. I’m listening to the Kingdom of Heaven soundtrack as we drive through the hills towards the abbey. It’s perfect music for it. 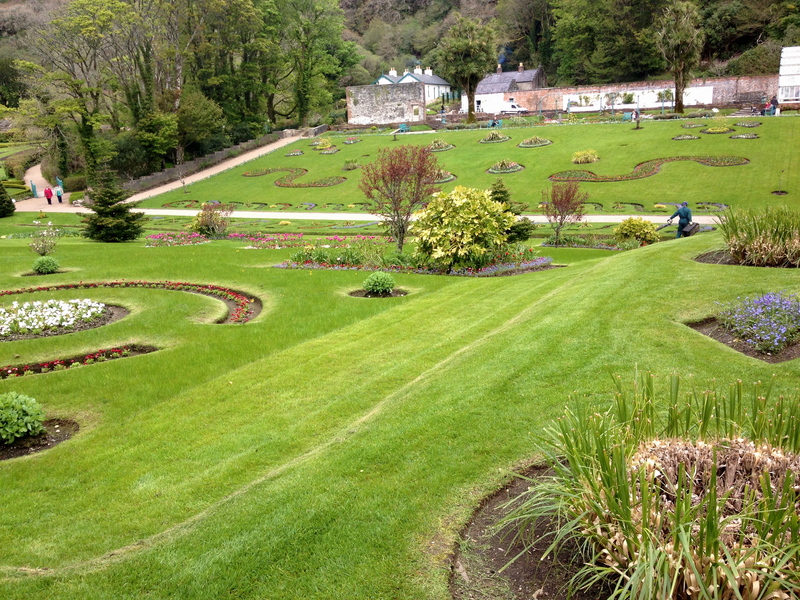 The gardens at Kylemore Abbey. 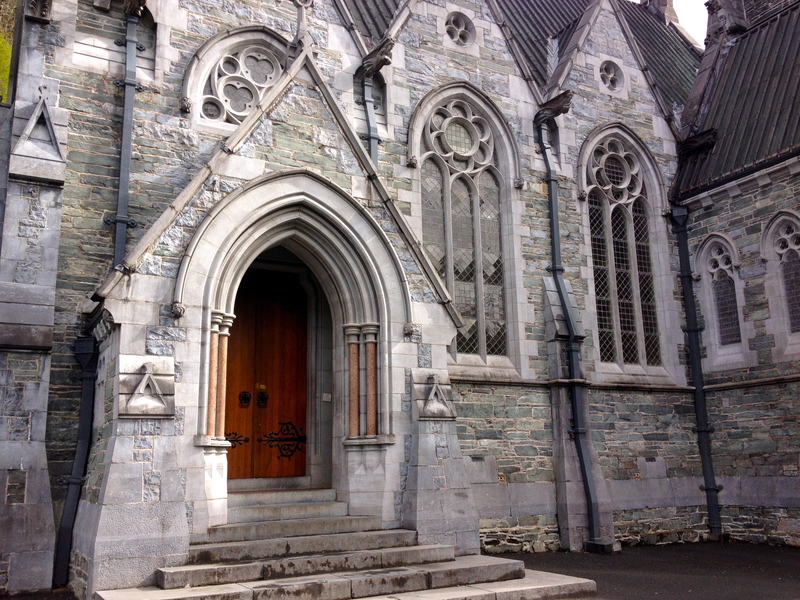 At Kylemore, we walked to the chapel first and the mausoleum, then we had a tour of the abbey/castle. We walked around the gardens. The aristocrat used hydroelectric power and a lime kiln before they were officially invented. The aristocrat who commissioned it all was very inventive. So smart. The whole thing was designed for and dedicated to his wife who then died in Egypt. 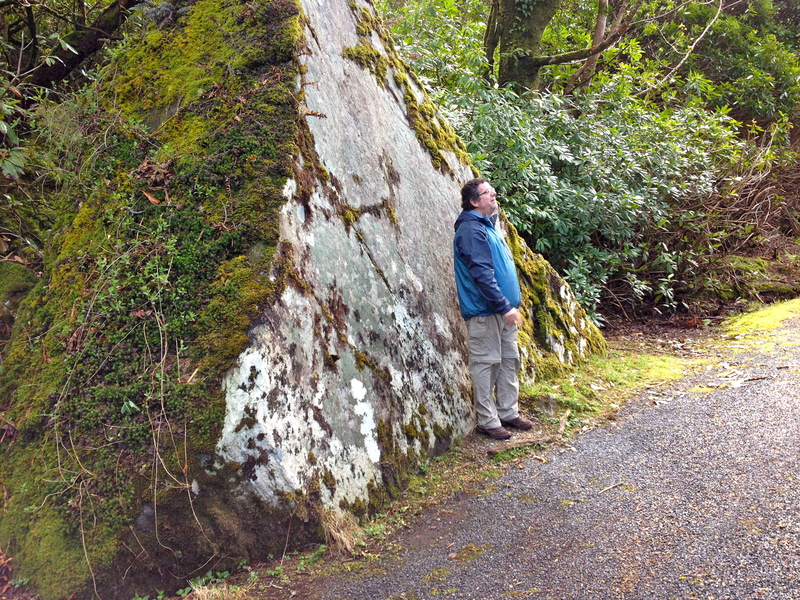 While at Kylemore, we went by the Ironing Rock. Legend says that if you stand with your back to the rock and throw a pebble backwards over the top, your wish will be granted. My rock didn’t make it. That’s okay. The Ironing Rock. With one of my professors for scale. We stayed at a hostel in Killiney (I think?). It was an adventure hostel, apparently, though most of the adventure part looks cold: water slides and stuff. Maybe it’s more for late summer. We drove into town to get food to make for dinner. We may or may not have flooded the poor little grocery store. I split the cost and work of making scrambled eggs and bacon with two of my classmates. The kitchen was hectic. Some people just had snacks while others made full pasta dinners with fresh mushrooms and stuff. The owners of the hostel told us that, because of a storm, the water had to be boiled. But they said it wasn’t dangerous and that they drink it all the time. After taking a bath, I realized the color of the water was a smoky orange: a color of tap water I’m used to, having grown up with iron-rich water. So I drank some, thinking that it was just really rusty because of the storm. If I don’t die, my prediction is true and I will be much happier and better hydrated. I feel fine so far. 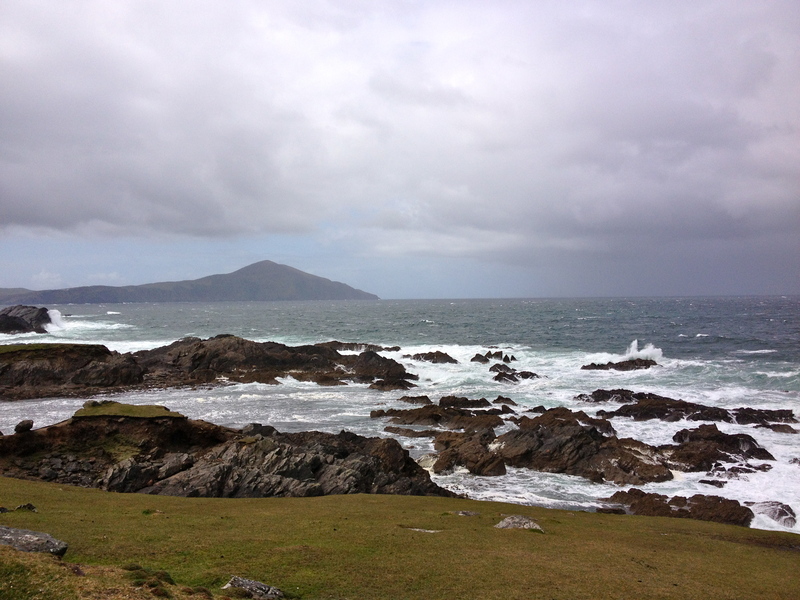 Achill Island is known for it’s peaceful protest against Lord Boycott (which is where the term came from). The workers decided not to work for Boycott, so he brought in soldiers to work his land instead, but they ate most of his crops and destroyed his land and fortune. On the road near Achill, I think. Sheep roam all over the wilderness. I wonder how the owner finds them or keeps track of them. There don’t seem to be any specific fences. But I know they aren’t wild sheep because they are spray-painted (the common method of tagging livestock in Ireland. I think it’s genius). The itty-bitty white specks are sheep. 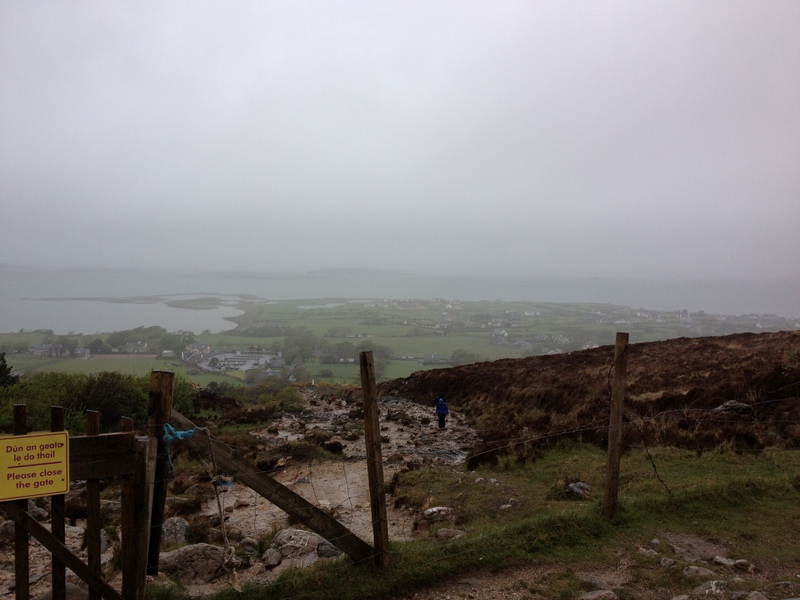 I got a glimpse of Croagh Patrick, which we will be climbing tomorrow. There is a church on top that you can’t see from the ground because it’s above the clouds. 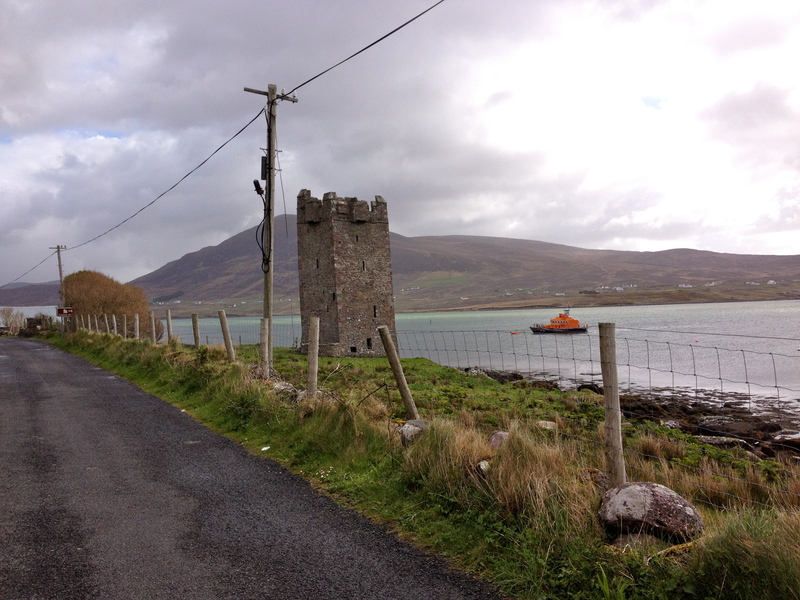 We are going to an island in Mayo called Achill to see Grace O’Malley’s Castle (she was a pirate queen. No, seriously.) She had a castle, but when we got there, it was bigger on the sign. It’s a single stone tower, and it’s blocked off. My professor said “Oh no. No way.” and climbed over the gate. We all got through. It was about as big as my bedroom. We had a good laugh. It’s still cool, though, because it belonged to a pirate queen. An Ghaeltacht: places where they supposedly only speak Irish, whereas the rest of Ireland speaks English and learns Irish in school. Skelling is a rock island out in the ocean that used to be a monastery. The sea is dangerous and getting to the monastery is quite the task. Two American tourists died trying to get there. 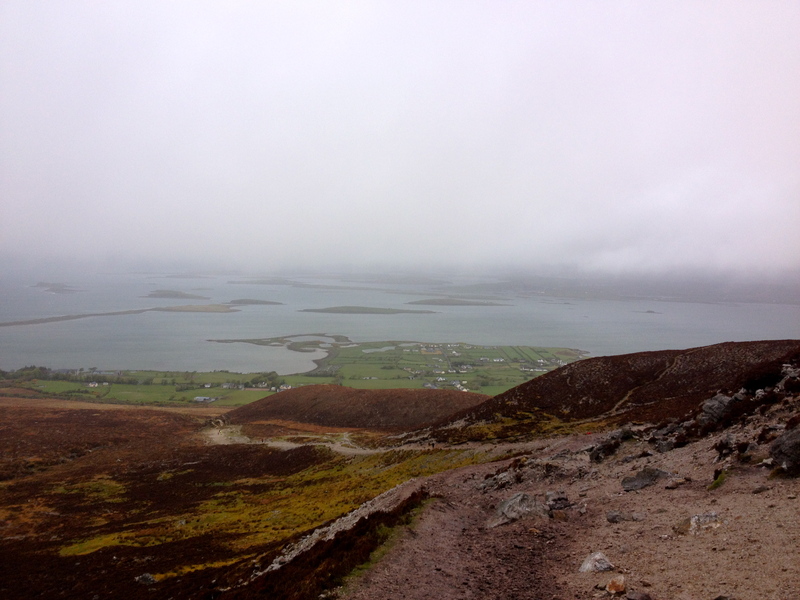 Today, we climbed Croagh Patrick. You can’t see the top from the base, which I think is important otherwise you would be less likely to continue all the way. It’s a pilgrimage that Catholics take. My professor did it barefoot when she was about twenty years old. While I would keep my shoes on, I wanted to try to make it to the top. 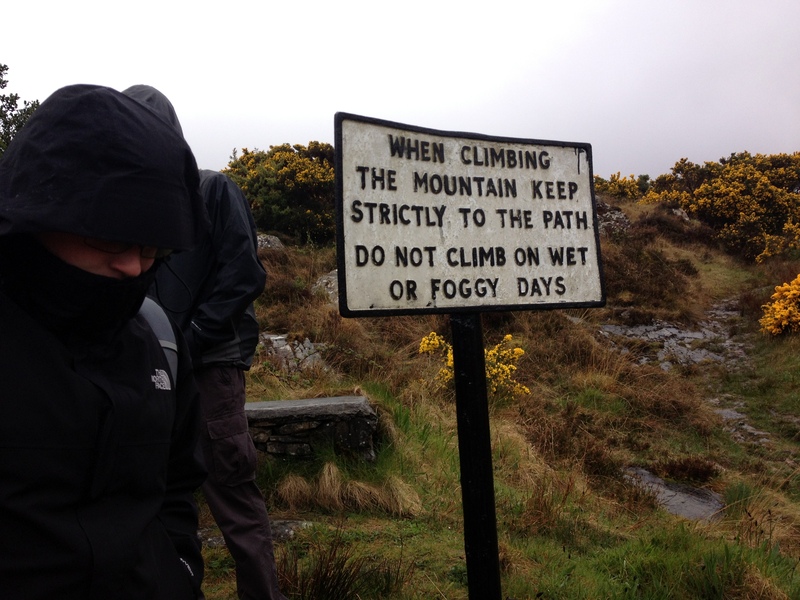 The sign at the bottom of Croagh Patrick, warning against climbing it on the kind of day we climbed it. I do what I want, Thor. I didn’t know if I could do it because it’s two and a half hours up, and the same back down. I ended up walking all the way up with two of my classmates. There are few things I’ve done that are harder than that climb. The last 45 minutes, there is no path and all the rocks are the size of footballs. 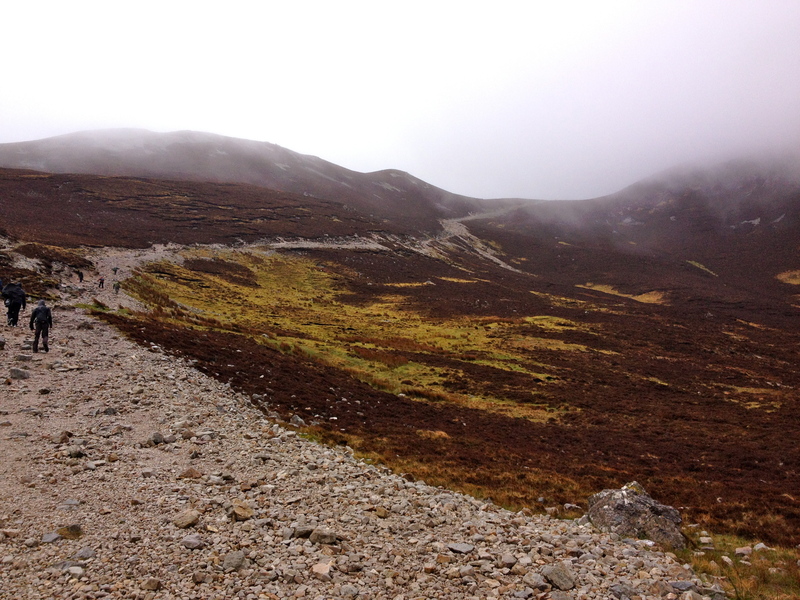 It would be hard walking on that alone, but to make matters worse, there were gale-force winds and rain and biting cold. I was wet all the way through most of the way up (and down). 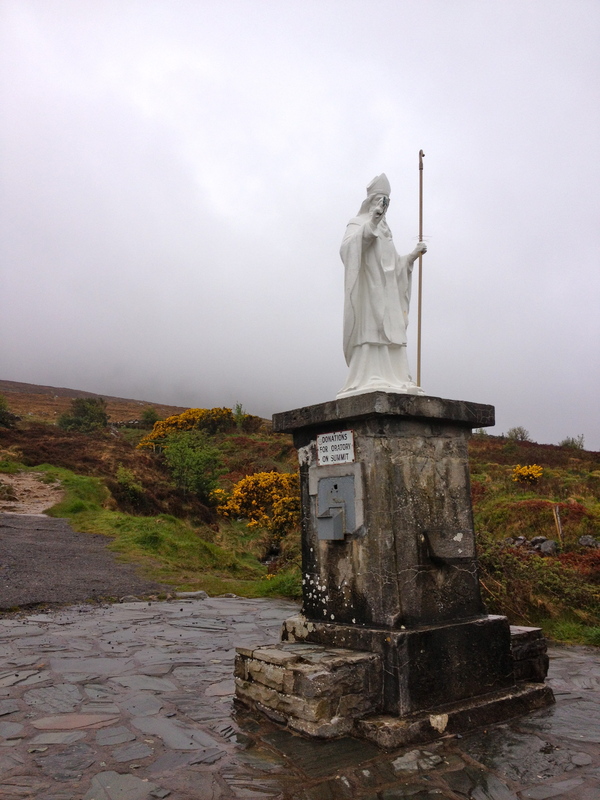 Statue of Saint Patrick at the base of Croagh Patrick. Before the trek, I put my money and passport and other things I didn’t want to get wet in a Fred Meyers sack. It worked really well. Everything else was soaked all the way through. 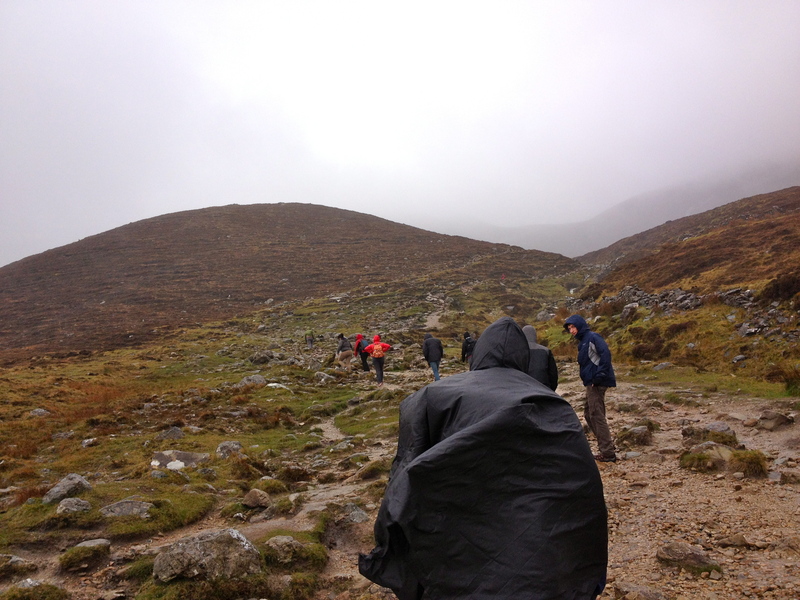 We almost got blown off the mountain once, but be held together and succeeded in staying alive. 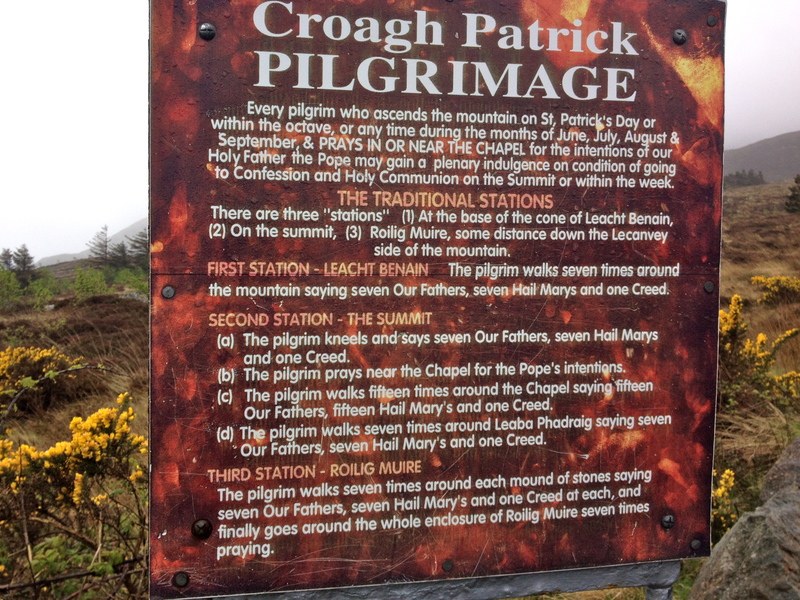 Instructions for the Croagh Patrick pilgrimage. I learned that when the wind starts to blow, grab onto something sturdy and make yourself as small as possible. Don’t try to hike through it. Just make like a barnacle and wait until it dies down. We made it to the top in 2 hours and 45 minutes. The top was freezing and windier and wetter than the rest of the journey. It was shrouded in fog so I had no idea how high up I was. St. Patrick’s white church sits at the top as a refuge against the terrors and suffering of the way up. A place where the wind can’t get you and where you can start to dry off and eat your food and prepare for the journey down, which many people say is harder. There were about 20 people up there in that refuge. The whole experience felt like a metaphor. My legs were shaking from strain and my hands were numb. I tried sticking my hands inside my coat and that was a little warmer. The hard part was knowing that you have to come down (2.5 more hours, remember). Such a beautiful place. Otherworldly, really. The whole experience was very spiritual for me. I decided that I was not just climbing the mountain; I was going on a pilgrimage. I prayed most of the way up and down. (Mostly for our safety, but about other stuff too.) I felt very close to God through the whole thing. I don’t know what it means yet, but it meant something. It gave me some skill or experience points that will come in handy. 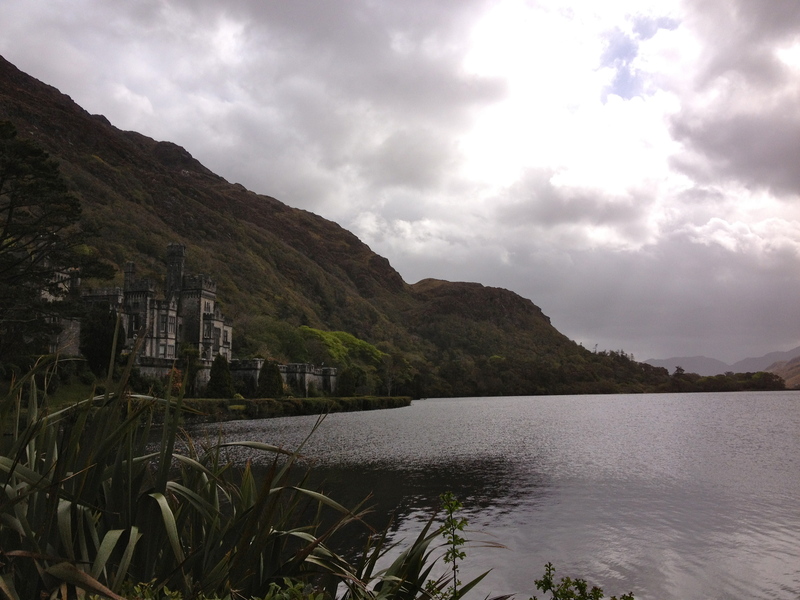 A/N: This is another installment in my posts about the trip to Ireland I took May of 2013.